WALTER BALDEY c. 1656 d. 1680 - ELIZABETH (Mother) c. 1656. WILLIAM BALDEY c. 1676 d. 1729 m. ANN WOOD c. 1679 d. 1744. WILLIAM BALDEY c. 1707 Falmer, Sussex d. 1757 m. 1733 Falmer, Sussex ANN NOKES c. 1713 d. 1749. WILLIAM BALDEY c. 1741 d. 1779 m. 24 Mar. 1761 Falmer, Sussex REBECCA PENFOLD c. 1732 Westmeston, Sussex d. 1784. JOHN BALDEY c. 1765 d. 1843 m. ELIZABETH BALCOMB- c. 1764 d. 1837. Falmer, Sussex c. 1806 d. 1873. BENJAMIN JESSE BALDEY b. 14 Aug, 1831, Falmer, Sussex d. 1915 Fulking, Sussex m. ANN SEPTIMA CUTTRESS 6 Feb. 1858 Edburton, Sussex b. Dec. 1838 Fulking, Sussex d. circa 1925 Cuckfield, Sussex. CAROLINE BALDEY b. circa June, 1858, Lewes, Sussex d. circa June, 1858, Lewes, Sussex. SARAH A. BALDEY b. circa 1859. ELLEN CAROLINE BALDEY b. circa June, 1859, Lewes, Sussex. SARAH ANN BALDEY b. circa Dec. 1863, Lewes, Sussex. BENJAMIN BALDEY b. 1864, Fulking, Sussex d. 29 Nov 1950 bur. Edburton, Sussex m. MARY STEVENS circa Mar. 1894 Edburton, Sussex b. circa 1872 d. 31 Jan. 1952 bur. Edburton, Sussex. BEATRICE BALDEY b. 24 Nov. 1877, Fulking, Sussex d. 19 Dec. 1957 Brighton, Sussex m. CHARLES ALFRED WEST 5 Dec. 1897 Brighton, Sussex b. 6 Nov. 1870 Brighton, Sussex d. 22 Aug. 1955 Brighton, Sussex. KATE BALDEY b. circa June.1880 m. - STEEL. (Lived and worked at Edburton before moving to Bourton-on-the-Water, Gloucestershire. Later moving to an old people's home in East Grinstead, Sussex). EDWIN BALDEY b. 1882 Fulking, Sussex. Children of CHARLES ALFRED WEST and BEATRICE BALDEY. CLARA ELEANOR WEST b. 21 Jan. 1898 Brighton, Sussex, d. Jan. 1983 m. GUSTAV EMIL LARSSON (JOHN) 14 Aug. 1919 Brighton, Sussex, b. 26 Dec. 1892 near Goteborg, Sweden, d. Jul. 1963 Brighton, Sussex. CHARLES PERCY WEST b. 6 Nov. 1899? Brighton, Sussex, d. 31 Oct. 1979 Kingsteignton, Devon, m. (1) KATEY/KATE? Brighton, Sussex, d. 7 Jul. 1955 m. (2) GWEN ? b. Birmington district, Warwickshire. HARRY LIONEL WEST b. 11 Dec. 1900 Brighton, Sussex, d. 15 Mar. 1979 Bristol Avonmouth m. NELLIE CAROLINE PAGE 11 Jun. 1938 Presonville, Brighton, Sussex b. 29 Oct. 1904 Shoreham, Sussex d. 26 Jun. 1971 Bristol, Avonmouth. 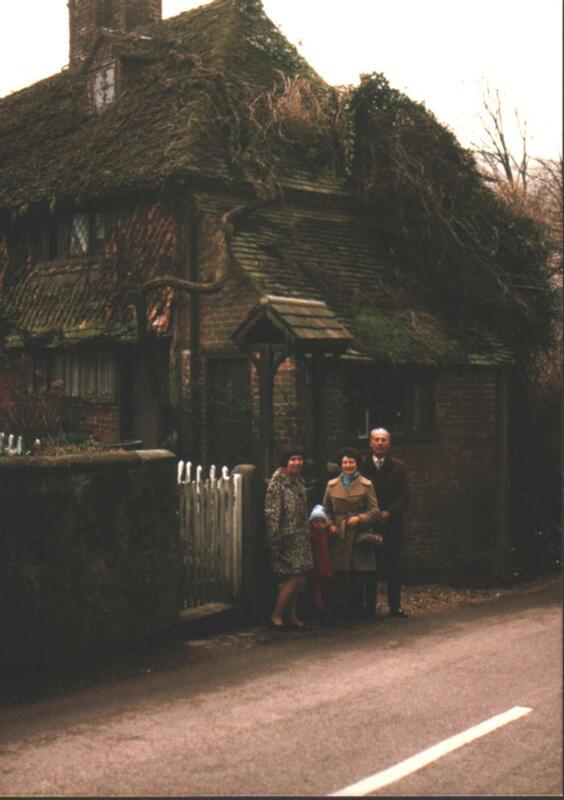 d. 20 Feb. 1988 Cuckfield, Sussex. MARGARET ANNE JONES b. 2 July, 1944 Brighton, Sussex, m. NORMAN MORLEY, Patcham, Sussex. TREVOR JOHN JONES b. 18 Mar. 1950 Brighton, Sussex, m. DOREEN JOAN FORDHAM 27 Oct. 1973 Patcham, Sussex, b. 30 Oct. 1946 Brighton, Sussex. Child of PETER NORMAN JONES and MARGARET MARY JUNOR. Children of GLEN PETER JONES and TRUDI MARIE LAWFORD. Below: ANN SEPTIMA BALDEY nee CUTTRESS (centre) with members of her family in the garden of 'Septima Cottage' in Fulking circa 1923/4. Back Row L to R: Nephew GEORGE PAYNE and possibly three of Septima's sons, the last believed to be CHARLES who was the publican of the 'Shepherd and Dog' public house in Fulking. Front Row: Septima's Great Niece EDNA MAY PAYNE, her mother ETHEL PAYNE whose husband is in the back row, the next person is unknown and Great Nephew RAYMOND PAYNE known as SONNY and brother of EDNA. Above: ANN SEPTIMA BALDEY nee CUTTRESS with members of her family? 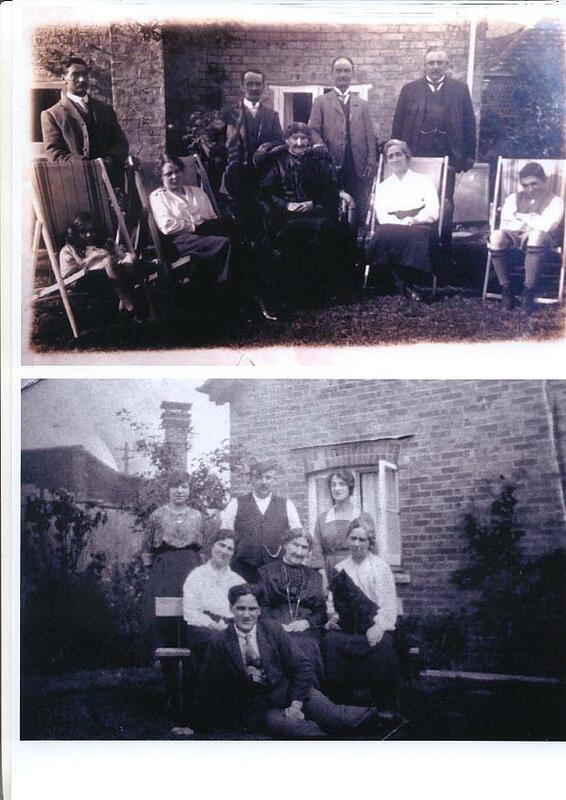 in the garden of 'Septima Cottage' in Fulking circa early 1920s. L to R: Margaret Jones, son Glen Jones, Kathleen Sayers (nee West) and Robert Sayers. 1974. "SEPTIMA COTTAGE", FULKING, WEST SUSSEX. "SEPTIMA COTTAGE", which was built in the 15th century, was named after Ann Septima Cuttress who later married Benjamin Jesse Baldey on 6th Feb. 1858. She lived in this cottage for 80 years from the age of six. Ann had 15 children including Beatrice Baldey born 24th Nov. 1877. Beatrice West nee Baldey was my maternal grandmother. John Ruskin one of the greatest figures of the Victorian age artist, art critic, conversationist, English author, philosopher, poet and scientist was quite often seen in Fulking and it is believed that he liked to see the sunsets there. Among his many talents was that of a geologist and his help and advice was sought by some of his friends in the village regarding harnessing the Fulking water supply. Fulking's very existence is due to the spring at the end of the village street which is said to never have run dry. 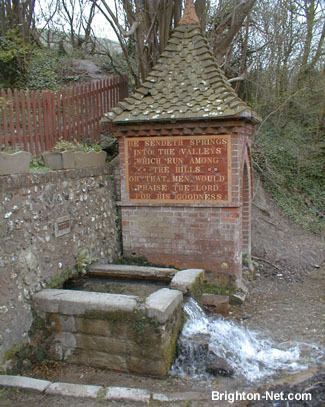 Ruskin helped and advised the villagers and in the mid 1800s the spring was harnessed to provide Fulking with its own piped water supply and the pump house and ram pump by the side of the road were part of the "set up" in use until 1953 when a new supply system was provided for the village. On the side of the pump house on Victorian tiles are the words: 'HE SENDETH SPRINGS INTO THE VALLEY WHICH RUN AMONG THE HILLS, OH THAT MEN WOULD PRAISE THE LORD FOR HIS GOODNESS' which came from Psalms 104 & 107. THE SPRING AND PUMP HOUSE. 'TO THE GLORY OF GOD AND IN HONOR OF JOHN RUSKIN PSALM LXXVIII THAT THEY MIGHT SET THEIR HOPE IN GOD AND NOT FORGET BUT KEEP HIS COMMANDMENTS WHO BROUGHT STREAMS ALSO OUT OF THE ROCK'. The fountain was erected by a local brewer. 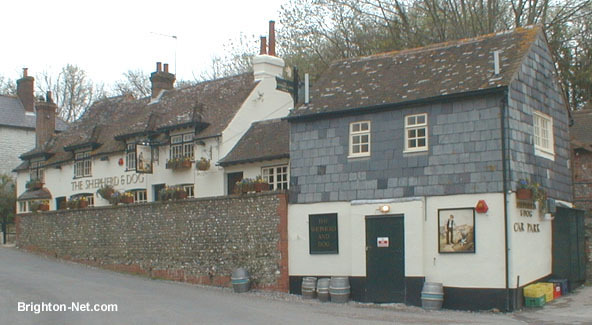 "The Shepherd & Dog" public house at the western end of the villages is a popular venue year round for locals and visitors to the district. In the Post Office Directories of 1905, 1913 and 1915 Charles Baldey was named as the publican of the "Shepherd & Dog" public house in Fulking and in the 1918 edition of the Directory Mrs. Maria Baldey was named as the publican. In a letter in a newspaper sent by an Uncle of mine, Harry West, it stated that "my Uncle Charlie and Rhoda were mine hosts of the "Shepherd & Dog" public house for many years until their deaths between the wars".